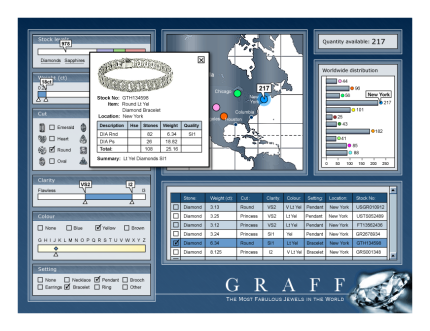 Enabling staff to locate the right diamond within Graff's many retail outlets across the world. Diamonds can be searched for across worldwide retail outlets using many variables such as: weight, cut, clarity, colour, setting etc. Once the right diamond is located, staff can request it and have it shipped to the nearest store to the customer.